The whole body is divided into ten equal longitudinal zones, running the length of the body from the top of the head to the tip of the toes and fingers. 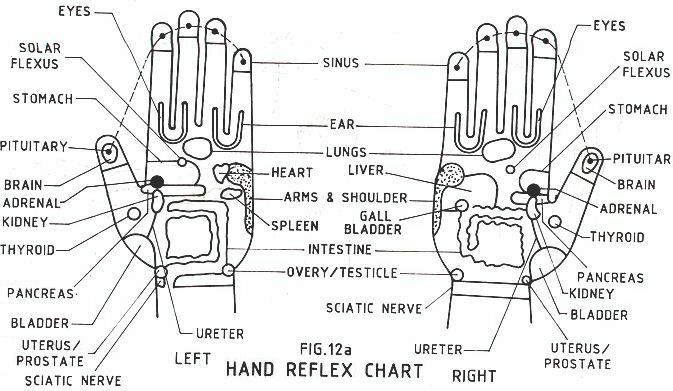 As the zones end on the finger tips and tips of the toes, the entire body can he manipulated by applying pressure on the tip of the fingers and toes. Any imbalance in any part of the zone can be corrected by applying pressure on the corresponding finger tips. Dr. William Fitzgerald of USA observed at the beginning of this century, that the direct pressure applied on certain points in the body produced an anaesthetic (analgesic) effect on the corresponding part of the person.He is known as the Father of Zone Therapy.He systematized the body in zones.This knowledge is being used for therapeutic applications.Zone therapy was popularized by Dr.Edwin Bowers who worked with Dr.Fitzgerald.Dr.Riley's assistant,Mrs.Eunice Ingham,charted the feet in relation to the zone therapy and their effect on rest of the body. Once I myself had a slight stomach ache after dining out at a party.Having worked with Zone Therapy on so many people,I felt I should try it out on self to get relief from the stomach ache. I started applying on and off pressure at the tips of the index and middle fingers.I stopped after 3 minutes.I felt a great relief in just another couple of minutes. It is indeed very difficult to explain the cure but one can certainly experience it. 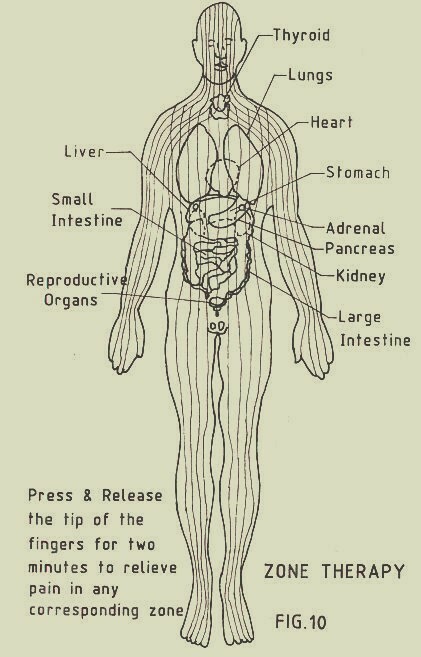 It causes responses (relaxation) in corresponding parts of the body which is the first step to normalization. The body returns to a state of equilibrium called homeostasis where easy circulation of blood takes place supplying nutrients and oxygen to the cells. It reduces stress, improves blood circulation, cleanses the toxins from the body, revitalises energy and balances the whole system. How to get the reflex points? Zonal imbalance is caused by internal blockages like calcification or pooling of lymph fluid or by external blockages like corns and calluses etc. Thumb walking or finger walking technique is used in which the thumb bent at the first joint is pressed bite by bite all over the feet or hands. Again pleasurable pain is the goal. Yes. It can be done by self and it is more effective when the reflex organ is imagined at the time of applying pressure and coordinated with breathing by closing the eyes. How long are these points to be activated? Apply rhythmic pressure for nearly fourteen times for curative purpose and for preventive purpose apply pressure for seven times. Zone therapy is the basis of hand and foot reflexology Working on the entire foot or hand affects the whole body. Here, in addition to longitudinal zones, the body is also divided into lateral zones. The main purpose is to fix the image of the body onto the foot or hand in proper perspective and location. The human body Consists of five sheaths namely Physical frame, Energy (Pranic) frame, Mental frame, Intellectual frame and Spiritual frame. To remain in balance at all levels, efforts are required to be taken on the physical level. Faulty postures and uneven distribution of body weight during standing and walking, lead to balance getting disturbed. 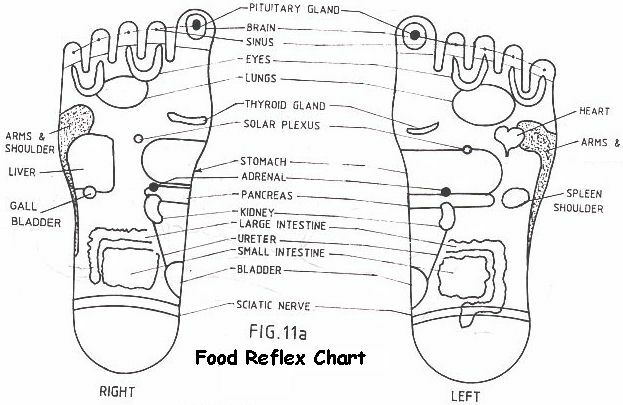 Similarly blockage and leakage from different nodes in the body disturbs the balance in energy frame. Intense likes and dislikes disturb mental frame. Intellectual frame gets disturbed due to ignorance and spiritual frame by not surrendering all our actions and ourselves to the Almighty. It is very easy to correct the physical imbalance by manipulating the legs, nodes in the hip, back and neck. The techniques explained here give immense relief to the patients suffering from any pain. 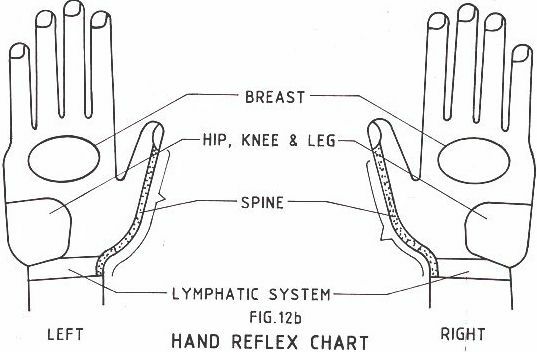 Before giving acupressure treatment, these balances have to be checked and corrected for effectiveness. The few thousand steps that we walk in a day produce jerks (on one side) and create pain, if there is a slight difference in the length of the two legs (lop-sidedness). Majority of people who have one-side pain in any part of the body have reported immediate relief after balancing the leg. 1. Ask the person to lie supine on a mat in a relaxed way and to take the hands backwards and stretch. 2. Massage the solar plexus and loosen the legs. Bring the hands to normal position. 3. Now with a ball point pen mark the topmost point on the projecting ankle bones on both legs viewing from the top,carefully avoiding a parallax error. Make a plus mark by drawing two lines perpendicular to each other on the point. 4. Now join the legs and observe whether the two centres match. If they don’t, then there is an imbalance which has to be corrected. 6. Take the short leg, flex it at the knee and push it gently towards the opposite shoulder. Now holding the knee with one hand gently push at the ankle joint towards inside of the body slowly and steadily enquiring for pain at every step. Now re-check to see if the centres match. If it is still shorter, make one more attempt. Short leg by convention is the one in which the mark is extending inside, with respect to the other, from the sole. 7. If you take the long leg push it away from the body following exactly the same procedure as explained at 6. 8. The thumb rule is to always take the short leg for correction. If pain is on one side, take the other leg and correct it accordingly. 1. Ask the person to lie on his left lateral position and fold the right leg over the left to block the energy. Press the centre of the right buttock with the thumb for few seconds and release. Repeat a few times, say five to ten. For fat people the point can be reached by applying pressure with elbows. 2. Repeat the same procedure on the right side after turning 180Deg..
1. Ask the person to lie prone. 2. Raise the head, neck and spine slowly as in Bhujangasana. 3. Locate the two dimples at the lower back. 5. Now massage the dimples clockwise and anti-clockwise with the thumbs and push the thumbs toward and upward the spine. 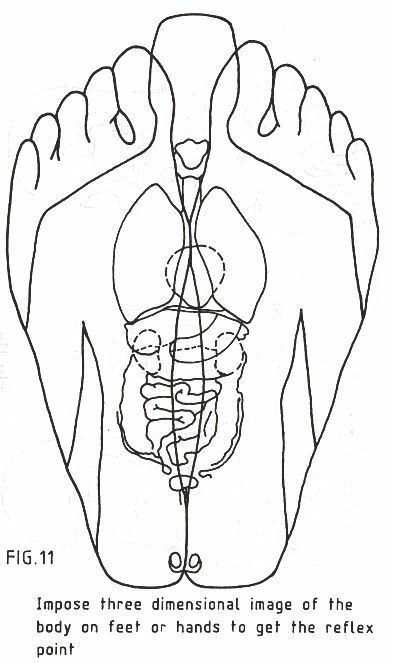 If the solar plexus or ‘nabhi’ shifts slightly, it causes an upset in the digestive system. It can be found out by measuring the distance between the navel and centre of the right and left side of the chest for men and navel and the big toes (left and right) for women. It can also be observed by feeling the pulse at the ‘nabhi’ and the level of the big toes in lying posture. 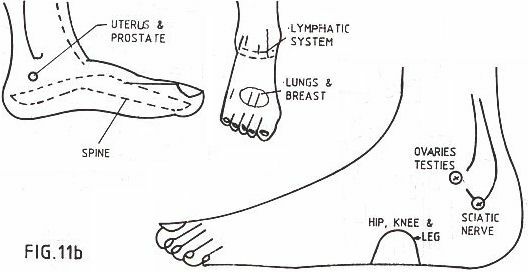 Shifting of the pulse from the ‘nabhi’ and difference in the level of the big toes indicates a shift in the solar plexus. 1. Ask the person to lie supine and make sure if there is disturbance of solar plexus by any one of the methods. 2. Slowly lift both the legs to 900 without flexing the knees and bring back slowly. Repeat this 10 times. 3. The shorter toe can also be pulled to correct this imbalance. 4. Another way of correcting is to create a vacuum around the navel by lighting a short candle or a camphor tablet and capping the flame with a stainless steel cup. Allow the cup to remain till the pressure is equalised and the cup is released on its own in a few minutes. A certain amount of skill is required to effectively do this. 1. Ask the person to lie supine and relax the body with some relaxation desserts. 2. Take a soft cloth like a dupatta and twist it like a rope. Hold the neck with the cloth such that you support the neck but do not lift away from ground. 3. Massage the neck muscles with the cloth without rubbing, by moving the hands up and down alternatively. 5. Repeat thrice and give a good massage with the cloth. Note: Should be tried only under expert guidance. 1. Ask the person to lie supine (on the back) and apply relaxation desserts. The word ‘Swai’ literally means to ‘swing’ or to ‘throw away’. Swaiso means to swing the arms back and forth with the feeling of throwing out the evil energy which is the cause of blocks and tensions, the root of all sorts of illness. 1. Stand firmly on the ground with legs and torso straight. Spread the feet to shoulder width and feel the toes slightly gripping the earth. This exercise is best done bare-foot. 2. Swing both arms backward and forward together using force on the backward swing and allowing the hands to come forward by their inertia. The elbows should be kept straight and the palms facing down. The eyes should be focused straight ahead and allow the mind to be empty by counting silently. 3. Begin the first session with swinging for just about a hundred times and gradually increase the number to a thousand per day, in two sessions, for healing purpose. 1. Relax the upper body above the hip joint completely. Allow the arms to swing naturally and do not tighten the shoulder. 3. Keep your back straight, arms loose and allow your mind to become still. 4. Focus your attention on the solar plexus region i.e., approximately three inches above the navel where the negative emotions are stored up. 5. Keep your palms down when you swing and the heels on the ground like heavy stones, with the toes digging at the earth. 6. Occasionally change the direction of your standing and find out which direction gives you the best effect. It is suggested that one can try these techniques after formal training or consultation with the Author. The Author does not hold any responsibility for what so ever if practiced without training. Web Design & Hosting By KANNAN MV.